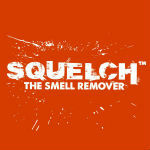 Get a free Squelch smell/odor remover sample. Like the Facebook page to request a free sample. Thanks Sharon, I marked it as expired. You may want to remove this one. I requested it week or so ago on their web site & got an email yesterday saying they were sorry, out of samples, but they could give me 50% off if I wanted to buy it. And the free sample offer is still up on their web site!